Beta-carotene and vitamin A help your body regenerate tissue, and the other ingredients in this treatment further support that process. This simple carrot treatment may help reduce the appearance of those annoying stretch marks that nearly always appear around the thighs, abdomen, or breasts. Stretch marks aren’t just a beauty concern. For a lot of women they can lower their self-esteem during bikini season or when they wear certain types of clothing. While these natural remedies may only help reduce the appearance of stretch marks, the results are quite positive and certainly worth a shot before you resort to something more drastic, like surgery. 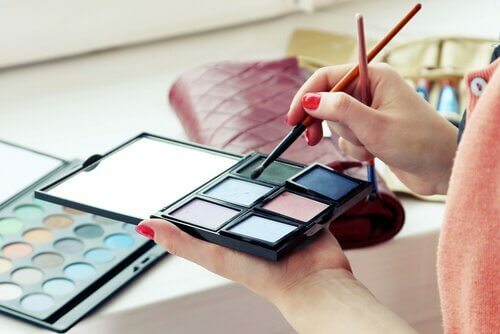 You can also combine your normal beauty routine with the treatments we’ll talk about today. We invite you to read the following information in the hopes that you’ll find it helpful. When you talk about carrots and their benefits for the skin, the first thing that probably comes to mind is that they help you get a better tan. The rupture of elastic fibers in the skin is the cause of stretch marks. Initially they have a reddish appearance but later they begin to take on purple or white tones. Carrots are among the best vegetables you can eat: they cleanse your bloodstream, boost your production of red blood cells (thanks to their iron content), fight premature aging, help detox the liver, etc. When it comes to stretch marks, however, carrots provide a bounty of nutrients to your skin, helping to regenerate tissues and reduce blemishes. 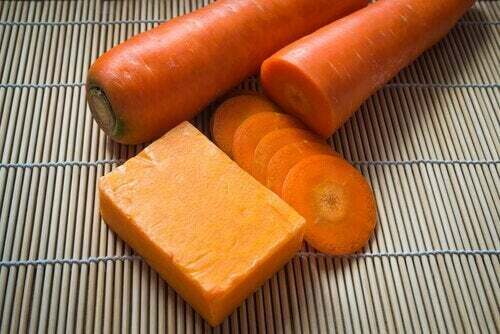 Carrots are rich in beta-carotene and vitamin A. Next to parsley, carrots have one of the highest content of nutrients, making them great for skin care and helping to eliminate blemishes and reduce inflammation. We’ll use six incredible ingredients to make this natural treatment for stretch marks. Read on to find out what they are. We’ll use two carrots to make this stretch mark cream, along with five other ingredients. This cream will last you a week, so make it part of your regular beauty routine. Aloe is a medicinal plant that’s well known for its healing and nutritional properties that help regenerate wounded or damaged skin. It fights the presence of stretch marks by softening their appearance and keeping new ones from forming in the troublesome areas around the thighs and abdomen. 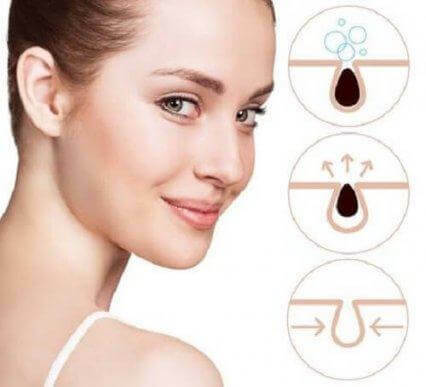 Aloe provides moisture and nutrients that regenerate tissue thanks to its content of magnesium lactate, which inhibits the breakdown of collagen and promotes circulation, avoiding those red or white streaks on your skin. With a bounty of nutrients like vitamins A, C, E, and B1, along with powerful antioxidants, avocado is a standard ingredient in all creams that claim to help regenerate the skin. When you combine it with carrot you get an exceptional treatment that may help reduce the appearance of stretch marks. Rosehip oil: rosehip oil is a natural way to treat stretch marks and scars. In this recipe, it’s important that you find 100% natural cold-pressed rosehip seed oil in your natural store to retain all of its original components. Almond oil: almond oil nourishes and repairs skin, providing elasticity and tone. When you mix it with the other ingredients you’ll see amazing results. Horsetail, one of the herbs with the highest silicon content in nature, is a part of our treatment for stretch marks. Thanks to silicon, it stimulates the production of collagen and regenerates tissues more effectively. The first thing you need to do is make horsetail tea. You’ll need 50 ml of water, a little less than a small glass, to make it very concentrated. Once it’s ready, reserve the liquid. Cook the carrots until they’re reduced to a thin cream. 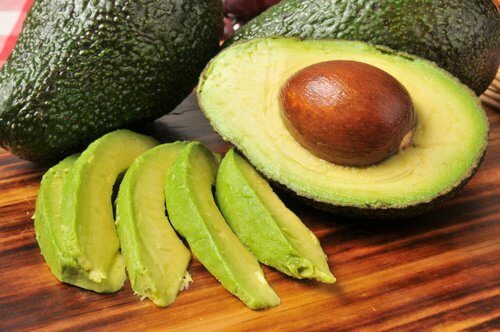 Add them to a blender with the avocado and aloe gel until you get a smooth paste. Once you’ve creamed all the ingredients, add them to a bowl with the horsetail tea and essential oils. Mix well with a spoon and store in a glass container. 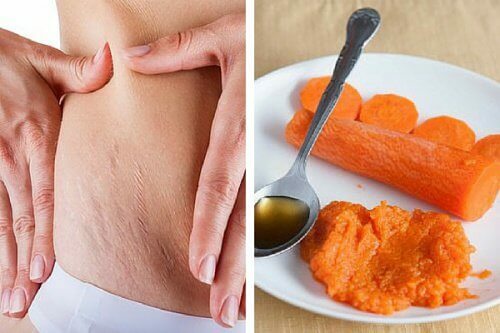 Every night spread the carrot cream on any areas where you have stretch marks. Leave it on for 20 minutes before rinsing with warm water. After a couple of weeks you’ll begin to see the results.